This pasta is filled with starches from your boiling noodles and not only contains nutrients but also helps to thicken as a sauce. In this case, l chose lemon juice and topped the dish with lemon zest for an extra touch of citrus. It is super light, but that's a good thing because you don't want to overpower with lemon flavor. Just a touch will do. Don't forget the jalapeno peppers and asparagus. Get a pot of salted water boiling and prepare your pasta as normal. 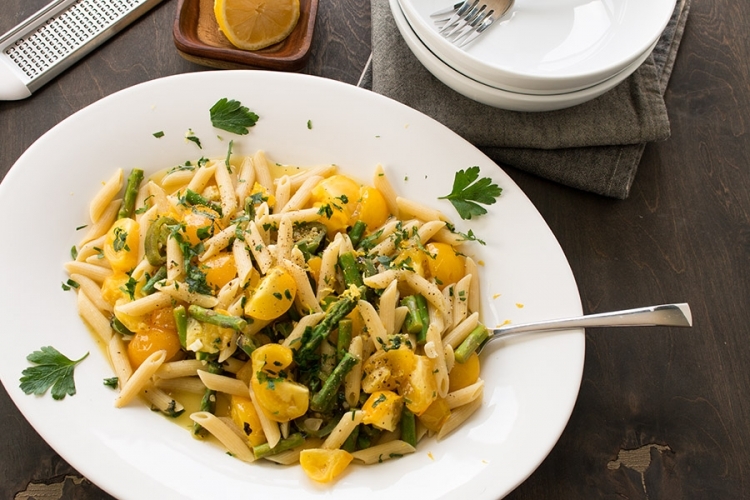 While pasta is cooking, heat a large pan to medium heat and add peppers, asparagus, garlic, and olive oil. Toss and cook about 5 minutes. Add tomatoes and basil leaves. Toss to combine and took about 2-3 minutes. You want the tomatoes to begin to soften, but not too much. Drain the pasta when ready and reserve about a quarter cup of the pasta water. Add lemon juice and reserved pasta water to the pan and stir. Add salt and pepper to taste. Pour pasta mixture into a large serving dish, then top with cracked black pepper, parsley and lemon zest. Serve!